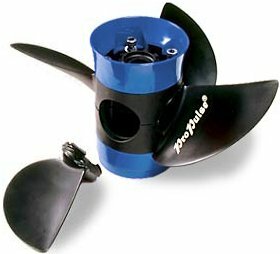 From "Motor Boats Monthly, February 2000"
The ProPulse composite propeller offers a couple of useful advantages over conventional cast-metal props. Not least because broken or damaged blades can be replaced almost immediately, without having to be sent off for repair. In addition you can also alter the pitch of the prop, depending upon what you are doing with your boat, be it waterskiing or running light or with a full complement of crew. By altering the pitch the engine can be 'tuned' for maximum thrust or efficiency. To effect replacement or tweaking you need only release the Allen screws, then either fit a new blade or rotate the boss, to give a slightly coarser or finer pitch. These adjustments will allow the outboard to deliver the right revs under different conditions; an incremental increase or decrease of around 200rpm from the mid-setting can be achieved in this manner. A further advantage is that being composite (plastic), rather than aluminium, the prop will not corrode, nor does it need to be painted to ensure it is kept in good shape. Hubs and blades are available for almost every make of engine, from around the 30hp mark up to 300hp.